Well, there’s good and there’s bad. Lack of sunshine at this crucial time of year is taking its toll of my poor vegetable plants. And too much rain. This is supposed to be summer in England, but it is more like a damp Monsoon, water-drenched swamp. Our Radishes have been good so far. We often use them just as a ‘Nibble’, with a little pot of Maldon Salt to dip them in. They just taste so peppery and crunchy, and are lovely to eat with a glass of beer or wine. Obviously I used them in salads a great deal, I just love the colour they imbue to a mixed salad. And they can be cooked – more about that in the future. Tomatoes in the greenhouse doing well. But not all is lost. Mustn’t give up hope. This Kitchen Garden Tale is promising. 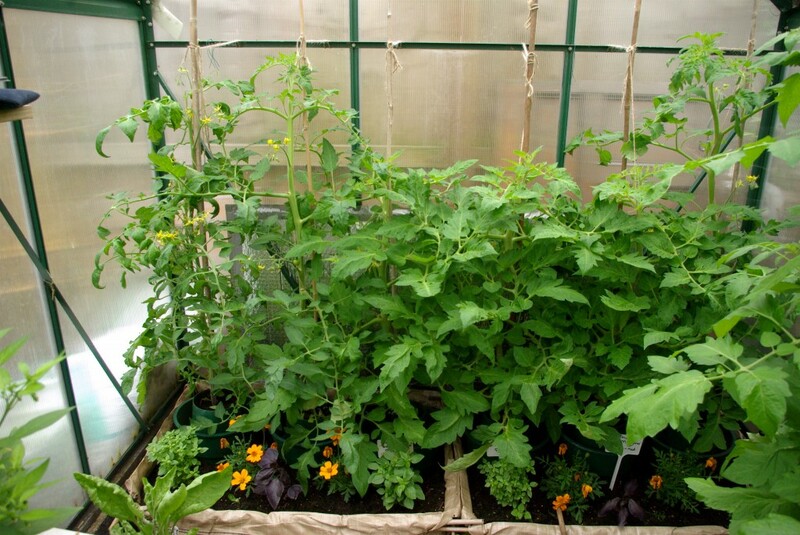 The tomatoes in the greenhouse are twice as high as those outside, and have lots of blossom on them. They are a bit leafy, but will take the bottom ones off as soon as the fruits have set. 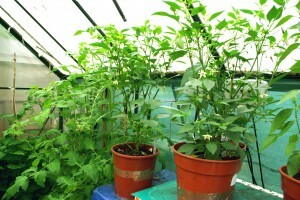 The Chillis (Cayenne, Jalapeno, Padron) and the Sweet Peppers appear to be reasonably happy in the greenhouse, producing loads of flowers and fruit. Padron could go outside in a sunny spot, if we had one. But until the sunshine decides to come out for more than half an hour, Padron will stay under cover. We love to dry Chillis – I use strong button thread, boiled to kill germs, and a big needle and thread them all up like you see in Greece, and dangle them from the wall or ceiling in the kitchen. Looks great, and just pick one off when needed. Another promising Kitchen Garden Tale. Our Broad Beans are just about ready to eat. I’ve been picking a pod everytime I have visited the Kitchen Garden, and some of them are now perfect. Ready for our favourite recipe, Broad Bean and Pea Bruschetta. This is one of favourite ways to use our Broad Beans and fresh Peas – it is so light and unbelievably tasty, with parmesan to give it a ‘tang’, and on freshly done oiled and garlicy Ciabatta slices, it make a wonderful lunch or first course. See below for the recipe. 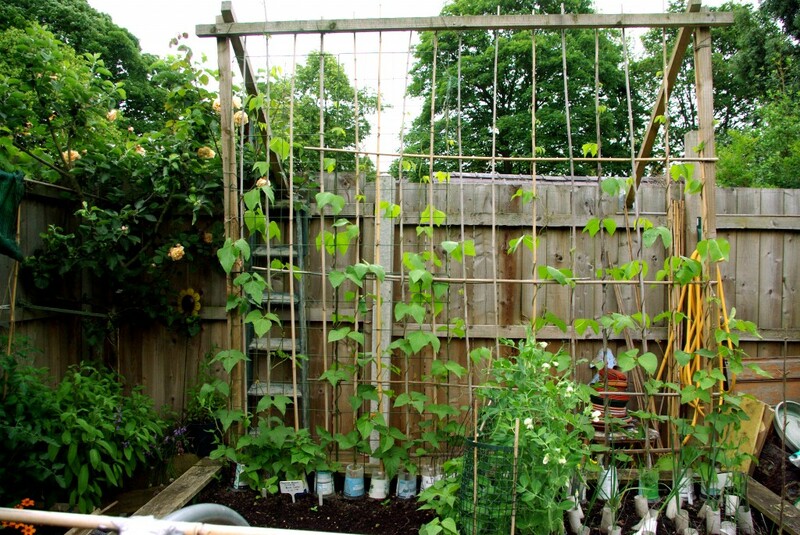 Well, this Kitchen Garden Tale is neither sunny or pretty, but touch wood, the Runner Beans and Purple Climbing French Beans and small Yellow Beans are doing well. There are now a lot of flowers on them, so here’s hoping they will all come to fruition. Also we have a few Sugar Snap plants ready to eat – Grandson Jacob loves these raw, so hopefully he will be visiting us soon. And my leeks, protected by toilet roll tubes (who said we don’t re-cycle) are doing nicely. All we need is sun. Please send some soon. For this recipe. 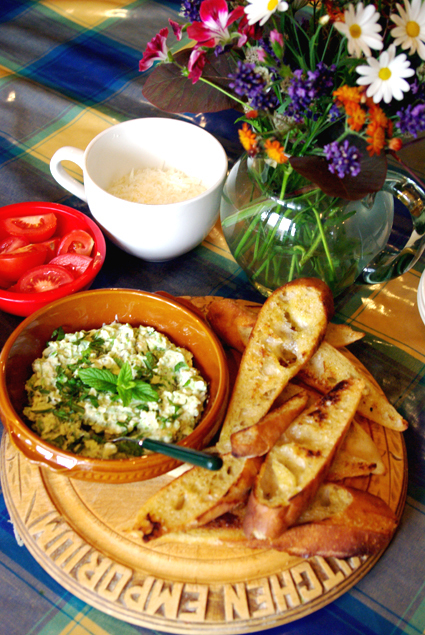 Broad bean & Pea Bruschetta, use the freshest small broad beans possible, and fresh peas. Olive oil to brush over bread slices. 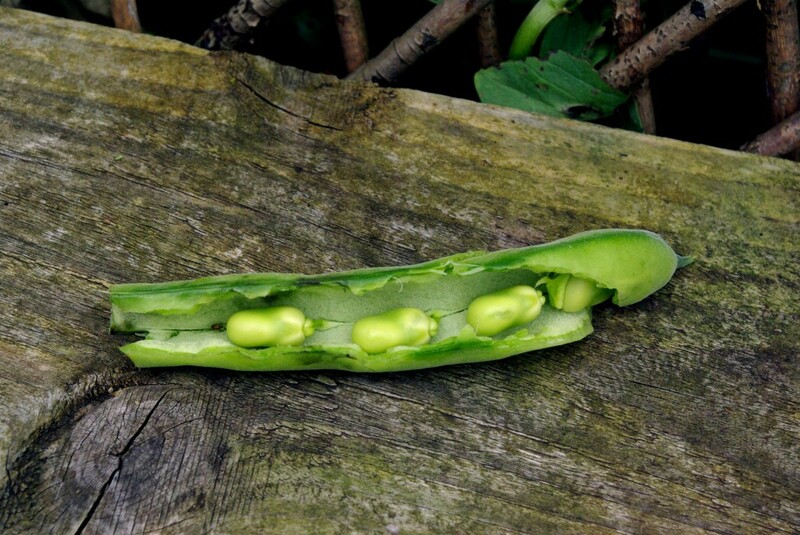 De-pod the broad beans and peas. The beans need to be only as big as your little finger nail - if larger, the beans need to be skinned- they will come off and be too tough. Place in a microwaveable bowl with a spoonful of water, and cover with cling-film, pricked with a fork. Cook on full power for one minute. Drain and set aside. To skin the larger beans, either the skins will have come off after one minute in the microwave, so you just pick them out, or put beans in a bowl of iced water. The skins should come straight off. Wash the mint and summer savory leaves then dry with kitchen paper. Place the peas, beans & herbs in a large mortar or bowl. Add a few fine gratings of lemon zest. Pound strongly with the pestle, or a heavy wooden spoon until roughly crushed. You don't want a smooth puree - more a small chunky mix. Add the ricotta cheese and a spoonful of good olive oil, and mix well. It must not be too liquid, or it will just slip off the bread slice. Add the Parmesan or Pecorino cheese. Season if necessary with more lemon zest and freshly ground black pepper. Slice the baguette or baton thickly on the diagonal. Brush with olive oil, and either lightly fry each side in a frying pan for 4-5 minutes (turning over), or, like me, put on the simmering plate of the AGA. As soon as the slices are golden and crispy, wipe the cut side of the garlic clove over the bread. Either put the bean and pea mix in a large bowl, or spread the bread slices with the mix. Finish off with a few sprinklings of the chopped Mint and Summer Savory leaves on top of the puree. Enjoy a Heavenly taste of the Broad Bean & Pea Bruchetta - I guarantee you will make this again and again.